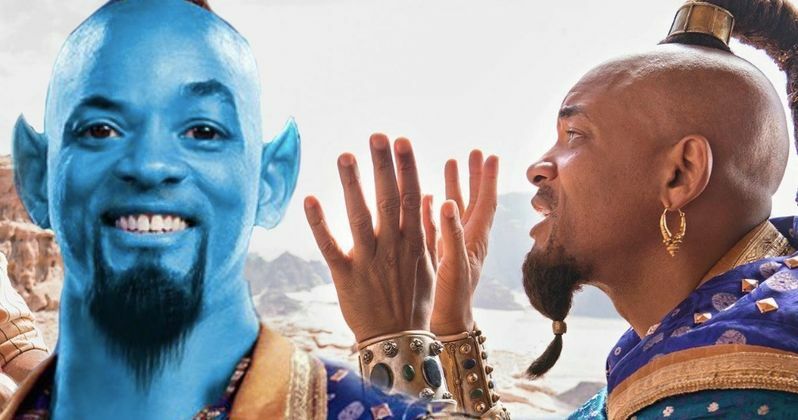 We got our first look at Will Smith as Genie in Disney's live-action Aladdin today and, while the internet had a lot to say about it, the primary sticking point is that his version of the character isn't blue. But fear not, everyone! Smith has assured that Genie will indeed be blue come time for the movie to arrive in theaters next summer. As is often the case with big reveals for big movies, Will Smith took to Instagram to share the Entertainment Weekly cover he appears on alongside his co-stars, Mena Massoud and Naomi Scott as Aladdin and Jasmine, respectively. Smith is well aware that Disney fans have a certain expectation and, in the caption he provided with the photo, the star offers some reassurance to those who have concerns. Here's what he had to say. Bam!! First look at the Genie, Princess Jasmine, and #Aladdin! Check Me Rockin' the Top Knot Ponytail Vibes in entertainment weekly (and yes, I'm gonna be Blue!)" This makes a good deal of sense. Even before the first teaser trailer was released in October, Will Smith said on Instagram that he couldn't wait for people to see him blue. But why don't these photos showcase him as such? There are two very good reasons for that. For one, as revealed in the Entertainment Weekly spread, the final CGI version of Genie in his blue form isn't finished. These things take time. The other piece of info comes from Smith himself who replied to a concerned fan in the comments section of his post. "I'm gonna be Blue! This is how the Genie is in Human / Disguise Form. My character will be CGI most of the movie." So there we have it. While it could be argued that Disney maybe shouldn't have released these photos until we could see Genie in his blue form, that's what we're going to get in the end and, really, that's what matters. What's more important is whether or not Will Smith can actually bring a version of the character to screen that fans will embrace. The late, great Robin Williams voiced the character in the 1992 animated classic and it's a performance, rightfully so, that many of us are married to. Even for a guy with as much confidence and charisma as Smith, those are some mighty big shoes to fill. This is just one of three remakes of animated classics that Disney has on deck for 2019, with Tim Burton's Dumbo coming out first in March, with Jon Favreau's The Lion King set to arrive in July. Guy Ritchie is at the helm for Aladdin, which will be coming our way on May 22, 2019. With that in mind, we should be getting a full-length trailer in the not-too-distant future, which will hopefully give us the Genie everyone wants to see. Be sure to check out Will Smith's Instagram post below. We also have BossLogic's big blue take on the character for you to check out, which gives us a tease of what we might expect to see.